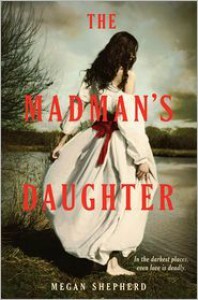 The Madman's Daughter is the first in series, inspired by the classic, The Island of Dr. Moreau by H. G. Wells. Thankfully, I was not familiar with H. G. Wells story going into The Madman's Daughter, as it does resemble the story closely and it may have ruined the element of surprise for me. Since I was not familiar with The Island of Dr. Moreau, I was in a constant place of trying to figure out who was really mad. There are a lot of uniquely odd characters that made the story very much of a thrill ride and the creep factor was amazing. I have never read anything like The Madman's Daughter. Seriously. That alone is worth the read. On top of that, the twists were unbelievable. You will have a hard time guessing the outcome, and the ending came as a shocker! I can hardly wait for the next installment. Be prepared to go into this one with an open mind. Considering the story line, there are areas where it is so out of touch with reality that it is hard to buy, but honestly, I wouldn't have it any other way.